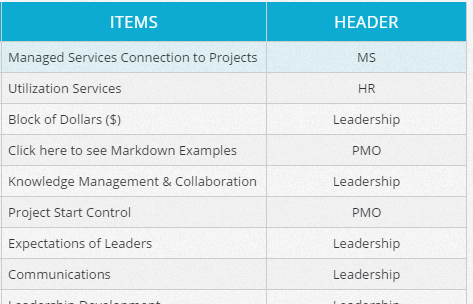 There are two key ways that roadmaps display headers and subheaders. One of these is understood as Repeating Subheaders (ABC ABC) and the other is called Sequential Subheaders (ABC DEF). These speak to different ways that data can be grouped. In the first way, each subheader has the same group of values under each header. In the second way, each subheader grouping is different. This is a group of subheaders that repeat under each header. Each subheader item repeats. Some may not appear if there are no items that fall into the correct category, but in both ways, the use case is similar. An example of this use could be when assigning owners members who all work together in an office who might work on multiple items. Note that because George does not have any items under Leadership his name does need to appear under the first header. 1. Create a header List Field on the table view and assign the different header values to it. The header used in the example is the team field, so the values should be the different teams within the organisation. 2. 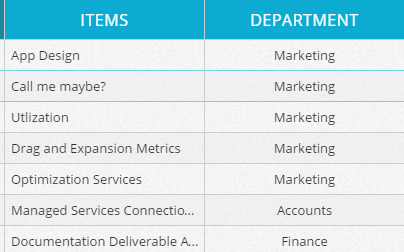 Create a sub-header List Field on the table view and assign the desired values to it as well. The subheader used in the example is the owner field, so the values should be the different owners within the organisation. 3. 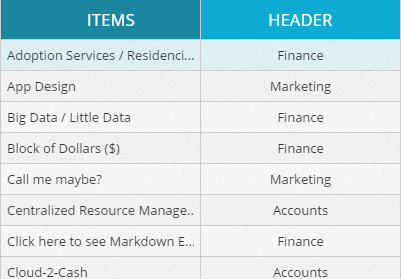 Assign the correct header and subheader values to each Item in the dataset. 4. In the timeline view select the Layout tab and set the header to header and the subheader to subheader. In this example, the header would be Team and the subheader would be Owner. This is a group of subheaders that appear in non-repeating sequences under each header. Each header has a different subheader group associated with it. An example might be where the organisation within each department is done differently. Note that there is no overlap of items between each header. The header used in the example is the department field, so the values should be the different departments within the organisation. 2. Create a sub-header List Field on the table view and assign the desired values to it as well per header. Important: All the different sub-header values MUST be within the same sub-header. 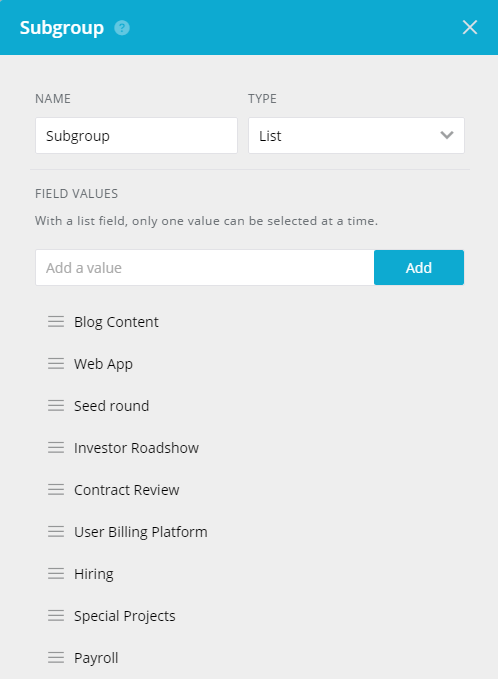 The Subgroup Field Card will contain all the values for each header. 4. In the timeline view select the Layout tab and set the header to header and the subheader to subheader. In this example, the header would be Department and the subheader would be Subgroup. 5. In the timeline view, use the hide button (looks like a minus sign) to remove subheaders and streamlanes that should not appear on the view.